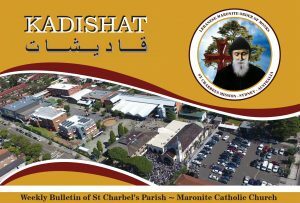 With the assistance of the parish priests of St Charbel’s, the young women of St Charbel’s parish have taken the initiative of starting a new women’s group called ‘Handmaids of the Lord’. It carries the Marian Spirit of the Maronite Church in venerating and honouring Mary as she is considered the perfect role model for every woman. As Mary chose to accept God’s will in her life, the young women today are also following Our Mother’s example. It is dedicated to the support, guidance and enlightenment of the young women of the community. “Handmaids of the Lord” involves a fortnightly meeting discussing spiritual and biblical themes and current issues that relate to young women of today in the light of our Catholic faith. All the young ladies are invited to attend these discussion nights. If you would like to know more about ‘Handmaids of the Lord’, please contact the parish office on 9740 0998 or email handmaids.stcharbels@gmail.com. Over 2000 years ago, the archangel Gabriel visited our Blessed Mother during which he informed her that she would be the Mother of our Lord, Jesus Christ. Today we reflect on Mary’s acceptance of Gods will and her solemn response of “yes”. Let us all be accepting of Gods will for us, and his overall plan of salvation. Did someone ask what’s coming up in Handmaids at St. Charbels? For Maronite Catholics, Good Friday is marked with 'monk's soup', a coffin full of flowers, and an ancient language from the time of Jesus. Calling all ladies to our next Handmaids talk held in the youth house at St. Charbels Church, punchbowl. “Qualities of a Woman” and how they can be used for good and bad. Our amazing speaker Sister Julie from the Schoestatt sisters of Mary will be discussing how women can use their qualities both positively and negatively. Sister will also provide practical advice for times when we may find ourselves in difficult situations. Come to our next talk “ Qualities of a Woman” and how they can be used for good and bad. We are delighted to have as our speaker Sr Julie from the Schoestatt sisters of Mary who will be discussing and providing some helpful practical advice. Learn how to sew it, knit it, bead it, paint it and make it your own from a variety of mediums. There will be free workshops, demonstrations and classes (cost depending on exhibitor) if you would like to come please contact the number!! Fee of $15 for entry and please bring extra for classes. Will be carpooling if you need a lift so let us know. It will be a day filled with craft fun! Don’t miss out on this incredible talk by Paul Elarde about our Mother, Mary. Handmaids are back, and we can’t wait to have you all join us for a great year of talks, fun social gatherings and prayer days. We can’t start the year without venerating and honouring ‘Our Blessed Mother Mary’ as she is the perfect role model for every woman. Our first talk for the year is on the 20th of February at 7.30pm inside the Youth House titled “Why Mary Matters”. We welcome Paul Elarde for the first time to the Handmaids, he is passionate about responding to Pope John Paul II’s call to the New Evangelisation. He has studied theology and has presented faith talks to young adult groups and parishes around Sydney for the past 15 years.